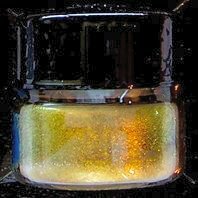 "dichroic coating without the glass"
For the first time offered anywhere, exclusively from CBS. 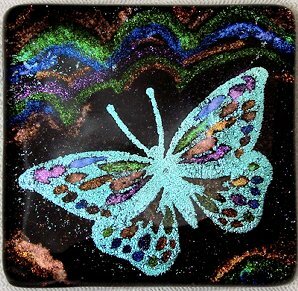 Not just a brand new product, but a brand new concept in Dichroic Coatings! 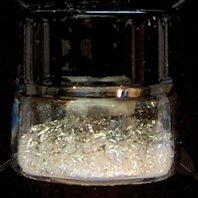 CBS Dichroic extract is a pure form of high quality CBS coatings literally extracted OFF of the glass and preserved in a glass container. How to use it? It is really straight forward! Watch this video by Don McKinney and Howard Sandberg for details. All you need is water and a fine tipped artists paint brush and a couple drops of water. 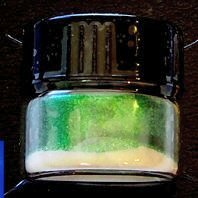 You get a 1/8th sheet equivalent of six different dichroic colors including two premium coatings (red/silver and green/magenta). 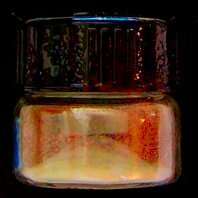 Each of the following jars contain the equivalent of 1/8th of a full sheet of dichroic coating. 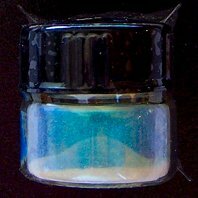 NOTE: The photos shown are good approximations of the actual colors you will receive. 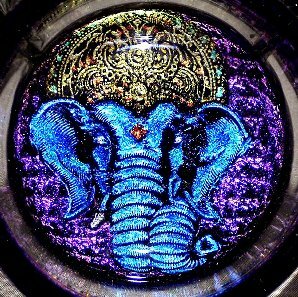 Like all other colored glass products, colors may vary batch to batch and like any image on the internet, the shades you see above depend on your computer's video settings. 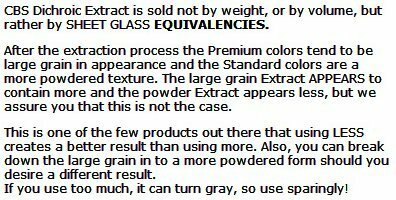 Dichroic extract sold above is the amount of dichroic material that would coat 1/8 of a full sheet (19" round). 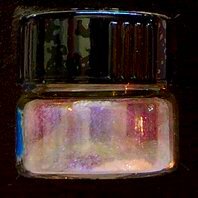 The alchemists at CBS remove the coating and deposit the resulting dichroic particles into small glass jars where every last bit is preserved. A tiny bit can go a very long way! * On our Free Shipping offer, as noted above, residents of Hawaii and Alaska may see shipping and handling charged by the shopping cart for this item. 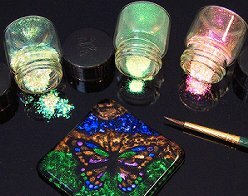 We will promptly refund the shipping and handling fee on the Dichroic Extract portion of your order. Shipping and handling fees will apply to any other items that you have ordered at the same time.